There's no denying that hardware control surfaces make life a lot easier when it comes to controlling key operational functions of recording software, but not everyone has the space or budget for a large, multi-channel controller. The PreSonus FaderPort is a new compact device that provides convenient access to what you're likely to use most, rather than trying to control every possible function. Physically, the FaderPort is about the size of a small paperback book and its housing comprises a folded metal facia over a plastic sub-chassis. It has a jack on the rear for connecting a footswitch, which is useful for hands-free punching-in if your DAW allows it. The top surface has a single long-throw motorised fader, a rotary encoder for pan adjustment and 24 illuminated buttons, five of which are transport keys. The unit connects via USB, from which it can also draw its power, although you'll need to connect the included PSU to use the fader in motorised mode. The FaderPort is compatible with all the commonly available DAWs for Mac OS X and Windows XP. It should be noted, though, that functionality is limited in some cases, depending on how the sequencer's own external control system works. FaderPort supports Cubase/Nuendo, Digital Performer and Sonar 6 directly, whereas Logic, Pro Tools and other HUI-compatible DAWs work via the existing HUI protocol. I tested the FaderPort using Logic Pro, which is currently probably the least well supported of all the common DAWs, though the imminent (at the time of writing) Logic driver should improve this. No driver software is currently needed, as FaderPort uses the HUI protocol to control Logic. So all you have to do is go to Control Surfaces Setup, select 'HUI' and then set the MIDI input and output ports to 'FaderPort'. In order to get a PC perspective on the FaderPort, Paul passed on the review unit to me after testing on his Mac system. Installation of the hardware under XP is a 'plug and play' operation and no specific drivers are required; the FaderPort appears as a generic 'USB Audio Device'. However, the supplied software CD did include a DLL file for using the FaderPort with Cubase (with which I intended to do my testing) and the installation of this is described very clearly in the printed manual. All went well enough with my desktop test system until I tried to specify the MIDI In/Out ports for the FaderPort within the Cubase Device Setup window; the 'USB Audio Device' drivers indicated in the documentation were simply not present to select. After a certain amount of head-scratching, re-plugging and connecting via both the motherboard USB ports and two different USB hubs, a quick visit to the PreSonus web site forums suggested that some other users have reported a similar problem and PreSonus are working to provide a solution. Some users have, however, also managed a successful work-around by switching to a different USB hub. Not to be deterred, I then tried to install the FaderPort on my new(ish) Rock laptop. On this system, the installation went without a hitch and, within five minutes, I had the FaderPort working perfectly with Cubase 4. While I didn't carry out any extensive tests, all the key functions worked as advertised. As with any control surface, it does take some time to adjust your working habits (in particular, taming the urge to reach for the mouse) but I could easily see how the FaderPort would speed up all sorts of basic mixing processes. In particular, I thought that the hardware transport controls and the ability to generate basic automation data for the Cubase mixer would be very useful. The transport controls handle the usual play, record and fast-wind functions, and pressing the fast-wind also gives you variable-rate cursor scrolling, where each subsequent press increases the scroll rate. I don't find this as friendly as a rotary jog/scrub wheel, but it works well enough for getting around. Above the main transport buttons is a shift key (momentary action to latch, or press and hold to use as a non-latching shift) and buttons labelled Loop, Punch and User. Using the shift key, these buttons also allow the user to create markers and to step back and forth through any markers placed in the track, though this seemed not to work correctly in Logic. I found I couldn't create markers, and when trying to locate one, instead of going straight there it simply opened the dialogue box that lets you type in which marker to jump to. However, it is no hardship to navigate markers using keyboard shortcuts. The single fader controls the currently selected track's level and, on DAWs that support it, may also be used to control the master output level. As touched upon earlier, this fader can be used manually with no additional power or it can operate in motorised mode when the included mains adaptor PSU is connected. A touch-sensitive fader cap facilitates the recording of mix automation in touch mode and there are separate automation mode buttons, all illuminated when active, for Read, Write, Touch and Fader Motor Off modes. Read and Write work as you would expect them to, and the last button is especially useful for mix playback, as it avoids the distraction of the fader noise. Tracks are selected using the track up and down arrow keys or, by using the Bank key, you can jump in banks of eight tracks. Mute and Solo also work correctly (these apply to the track mixer, not the Arrange page) while the Rec button arms a track for recording as expected. An Undo (or Redo if you use Shift) button steps through your various levels of undo or redo. If the designers are open to suggestions for future firmware updates, I'd like to see the Pan control double as a cursor position wheel in conjunction with the shift key, as it offers more precise control than the fast-wind buttons. My test with Logic Pro on a G5 machine ran fine, with no problems other than the marker behaviour noted earlier. However, when I did the same test with a Macbook Pro I couldn't get the pan control to respond. Hopefully the forthcoming Logic driver will avoid this kind of inconsistency, but I suspect the problem was in Logic Pro 's (Intel version) HUI support and nothing to do with the FaderPort hardware. 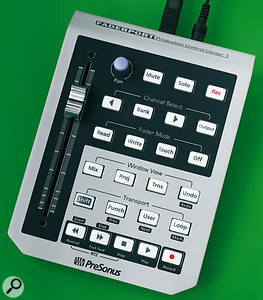 Despite some of the functions not currently being supported in Logic, controllers such as this (also see page 190 of this issue for some alternatives) really improve the experience of operating a software DAW, and having only one fader can actually be an advantage, as you're not continually looking around to see what fader controls which track, since the currently selected track, bus or output is always live. 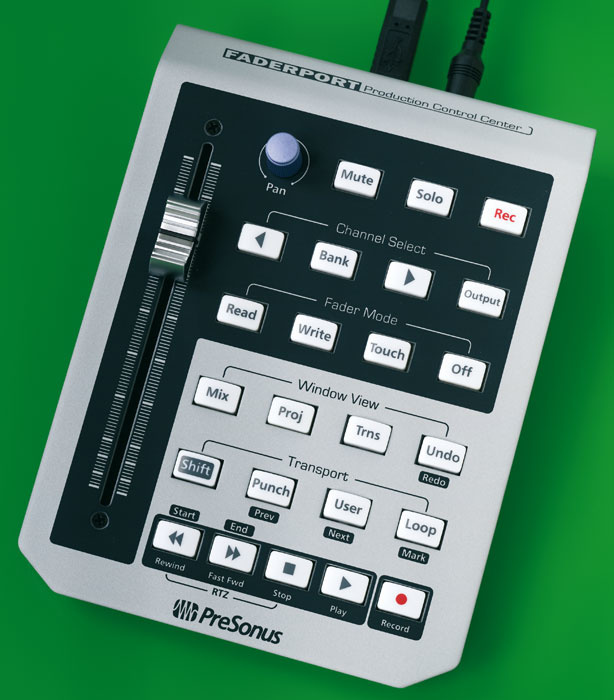 On my own Mackie Control system, the transport section is by far the most used part of the surface, along with the automation mode and loop/punch buttons, so I think PreSonus have picked the correct functions to place at your fingertips without making operation in any way complicated. I would have preferred a wheel to control the cursor, but other than that the FaderPort is a very neat solution for the home studio or on the road. Handles all the main transport and automation functions. Not all functions work as they should in all DAW applications, though the forthcoming updates should remedy this. Currently there are relatively few small devices of this type on the market, but it seems like a great idea for anyone who has limited space or needs their controller to be portable. Simple though it is, the FaderPort makes operating a DAW far more pleasurable than working by mouse and keyboard alone. Source Distribution +44 (0)208 962 5080.